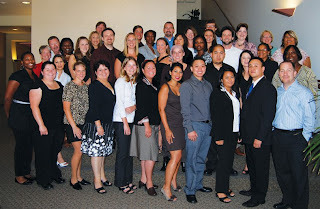 Above is a recent photo of Parasec’s Sacramento office staff. What a wonderful group of people we have working with us -- not only in Sacramento but also in Delaware, Los Angeles and Nevada! I just want to spend a brief few minutes talking about these remarkable people. It has often been said that the hardest part of management is dealing with employees and I certainly agree that the most difficult and stressful situations in business frequently revolve around issues with staff. But, when you have good employees who care about the business and about their fellow employees, management becomes a whole lot easier and the rewards of employees far exceed the headaches. That is the case with Parasec. We have, over the years, brought together an incredible group of hard-working and dedicated individuals who perform miracles when needed for our clients, work harder than they have ever worked at any other job and have a lot of fun while doing it. These individuals have not only learned how to do their jobs exceptionally well but they have also learned about the basics of how a business is run and have willingly brought new ideas and creative thinking to those situations that needed a new vision. When there are difficult decisions to be made, I often share the facts with everyone and ask for suggestions because they are on the front lines and usually have a better perspective and understanding of the situation than I ever will. The solutions that arise as a result are always better than my management team and I could come up with completely on our own. This is a difficult time as a result of the economy. Parasec’s absolute number one priority for our staff is and always will be job security. With that in mind, we have recently cut back or eliminated many of the little perks that all of us have grown used to. We don’t know how deep the recession will go or how long it will last so we want to be proactive about deeply cutting our expenses to ensure we can retain all of our employees no matter what happens in the economy. We got some wonderful ideas from staff that we would never have thought of ourselves on additional places to cut and ways to avoid expenses. People got on board and helped us trim fat that we didn’t even realize was there. I just want to thank all of Parasec’s employees for their commitment, their dedication and their willingness to question everything and share their suggestions. I’ve never worked with a better team and I’ve never been more proud of any group of people than I am of the current Parasec staff. If the economy is going to turn around as a result of the hard work of U.S. employees, then Parasec employees will be leading the way! Lynn is a solid leader who sincerely cares for her staff. It is reflected in her daily interactions with us and because of that, we are a solid unit that will do whatever it takes to make our business successful. Thank you Lynn for leading the way and being an example that truly inspires us towards success. Wow, thank you so much for the very kind words! I guess the respect goes both ways and that's a very good thing!